BASEC’s attendance at this year’s Middle East Electricity (MEE) exhibition in Dubai, 5-7 March, reflects our role as an independent global leader in cable testing and certification. In particular, we will be showcasing our strengths in supplying these services across the entire region. These will be provided directly from a new, dedicated team that we have set up specifically to support the Middle East and Africa. 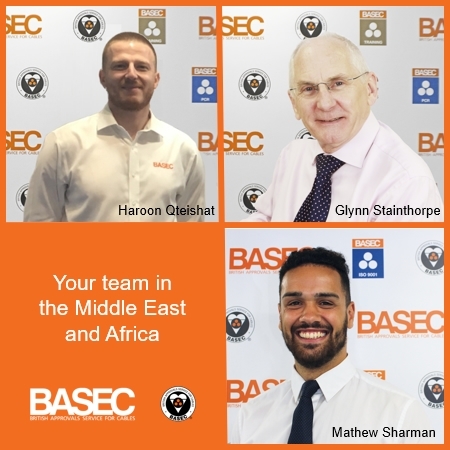 Made up of Haroon Qteishat – Regional Commercial Manager who is based in our Dubai office, and supported by Glynn Stainthorpe – Regional Technical Manager and Mathew Sharman – Customer Account Executive. As the world’s leading power event, MEE brings together leading manufacturers, global experts, governments, procurement specialists, project managers and contractors to drive cost-effectiveness and efficiency, and move projects forward. Across the Middle East and Africa, new build projects are making a major contribution to the demand for cables and ancillaries. This activity involves many participants, starting with the end users and their influencers, incorporating the electrical-design architectural engineers and consultants, together with the contractors, buyers and quality managers also involved in the buying process. Then, there is the supply chain, from the manufacturers to the wholesalers, distributors and stockists, that delivers on these design decisions. Finally, there are the regulatory bodies that enforce the mechanical, electrical, environmental and fire performance standards that the cables must meet. While these stakeholders have widely differing perspectives, they can all gain critical advantages from using BASEC’s universally-trusted mark for their cabling requirements – whether they’re for power, energy, data or signal cables, or ancillary products. Suppliers will sharpen their competitive edge by gaining and demonstrating hard proof of their cables’ quality and compliance, while protecting themselves from the damage to their reputation and business that will arise from delivering sub-standard or counterfeit products. Meanwhile, consumers can specify cables with a BASEC mark for assurance that they will fulfil their expected roles reliably and safely after installation. BASEC provides product certification, which is amongst the most rigorous in the industry, as well as cable testing to ensure products are compliant with the relevant standards. Our goal is to help you to understand and apply consistent levels of cable quality and to assess how the component materials will behave over time, with respect to all risk factors, including fire, electrical, mechanical and chemical. We also perform specific one-off testing on cable products, as required. BASEC schemes are operated discretely and as part of integrated management systems assessments, covering the BASEC product certification requirements, quality management systems to ISO 9001, environmental management systems to ISO 14001, and Health & Safety management systems to IS0 45001. Our expertise in renewable power is particularly important to the region; this already significant part of its electrical industry is expected to show sustained growth, with ambitious targets set for 2030 through to 2050. While this sector represents great opportunities for suppliers, it also brings significant challenges. DC cables for solar projects must comply with many stringent environmental and mechanical demands to be accepted for project installation. As a solution, we can help manufacturers reliably and efficiently confirm that their products meet IEC 62930: ed 1.0:2017 and (BS) EN 50618:2014, which are the relevant standards for these cables. Overall, BASEC is a recognised sign of assurance, symbolic of independent cable testing and approval. As an independent body, it has for over 45 years been a mark of reassurance to those specifying cable.